Usually ready for picking in mid September, and can be stored well into the new year. 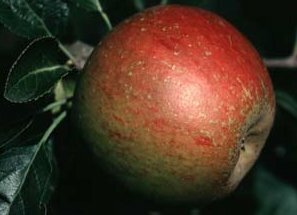 Generally regarded as the finest flavoured of all English apples, this variety needs good soil conditions to crop well. Not recommended for very cold or very wet areas. The trees are vigorous, with good, angle branches. Fairly upright and then spreading habit. The fruits are medium sized, round to conical, golden yellow with up to three quarter flush with orange, red streaks and some russetting. The flesh is firm, creamy yellow, crisp and juicy. The flavour is superb, rich and very aromatic. Susceptible to Scab and Mildew, so spraying is required.Good pollinators include: Discovery Egremont Russett and Redsleeves but Greensleeves and James Grieve have proved exceptional.